If you have questions or would like information on our adult faith formation programs or how you can become involved in Spiritual Formation with either St. Paschal Baylon or the Church of St. Clare, call Barbara Curran at 440-840-5511, Rosalie Lewis at 440-227-8718 or Jo Ann Lane at 216-926-7321. The committee's mission is to build and raise awareness of opportunities for adult education and spiritual enrichment. 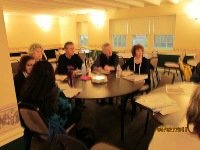 Members work to plan, publicize, enhance, create, and assist with a variety of programs for adults, promoting existing spiritual events as well as developing new opportunities at St. Clare and our cluster partner St. Paschal Baylon. Our vision is to stimulate spiritual growth and fellowship within our parishes and evangelization to the Hillcrest community. Past educational programs have consisted of scriptural and liturgical studies, parish missions, special speakers and talks. Scheduled events allow for reflection and prayer encouraging personal growth and knowledge of God. 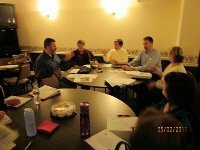 The combined St. Clare and St. Paschal group meets semi-monthly, usually on the first Monday evening of each month, alternating between the two church locations.